The PDC information you see on these pages is being grabbed off air by an Acorn Teletext Adapter and digested by a BBC Micro. 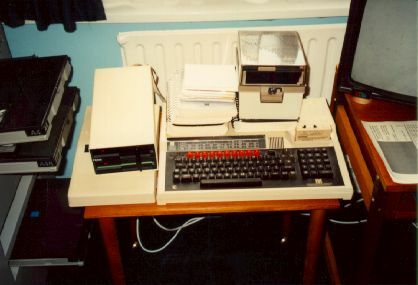 The error-corrected data stream is then logged by a PC running Linux and made available to the wider world by a radio link over a Scarab 20km Wireless Modem. The PDC packets are batched as they arrive on the PC, then periodically forwarded to the Web server over the radio. Currently the forwarding occurs after a packet arrives after 10 minutes or when 100 packets have been received. The initial development was done on a BBC Master, but that machine is off doing other things at the moment (it's running my front door lock). This page was created on 22 July 1996. It was last updated 08 September 1996. Copyright (C)1996--2004 Robin O'Leary. All rights reserved.